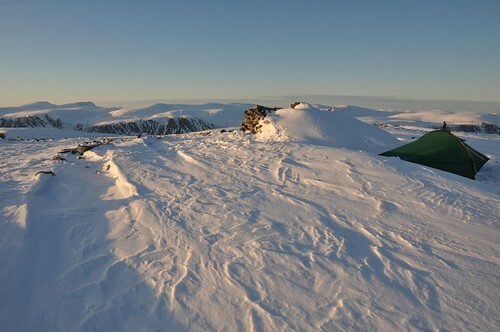 A High camp on Beinn a’ Chaisteil above the shores of Loch Vaich. 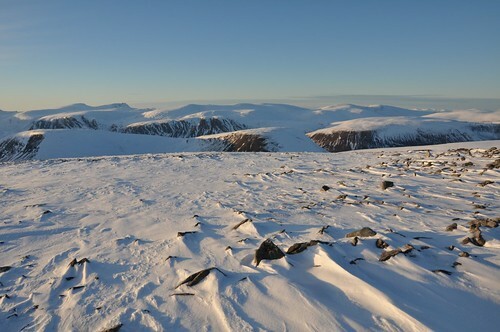 I had tentative plans for a camp on Ben Wyvis, looking to return over its Little brother the following day, but thought it may be busy. I decided on another hill just a little further north fully expecting (and finding) a much quieter time. The Wyvis car park looked to be full on Saturday and Sunday as I passed, so a good decision really. Carried on up to Black bridge arriving at a not too early mid-day, however it didn’t take too long to get booted up and on my way. 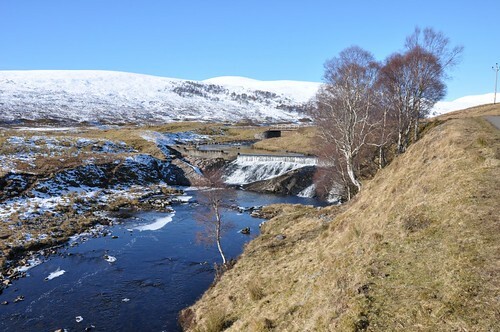 After following the estate road up Strath Vaich as far as the bridge over Abhainn Strahth a‘ Bhathaich. I took to the path opposite the Weir running along the south east side of a small hill. As I climbed I spotted what looked to be a shooting party returning to the cottage at Lubriach just below my vantage point. After crossing a small stile I was already above the snow line and soon lost the path before reaching the track south of Meallan Donn. 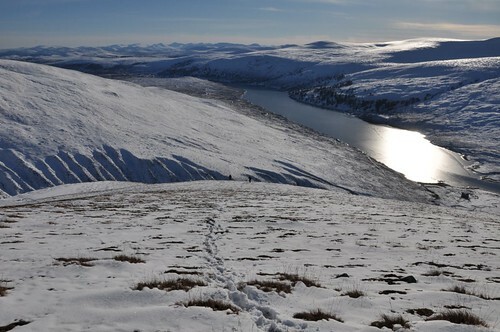 I pondered the merits of continuing up the hillside to climb Meall a' Ghrianain on my way out, but the snow covered heathery slopes looked like hard work for an ascent. So, after following a loop in the track downhill I was soon back on the main track and approaching the dam that holds back the waters of Loch Vaich. 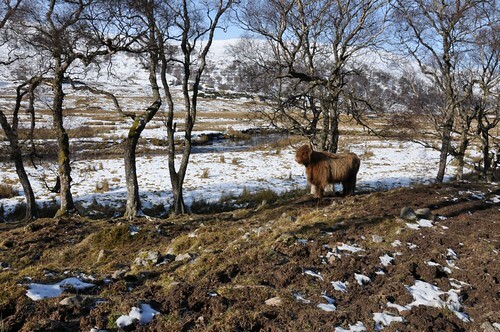 The going remained good as I continued on my way to the buildings at Lubachlaggan. The only marks on the snowy road surface were those of animals, the most prominent being those of deer. After passing though a gate in a fence protecting newly planted trees there were much fewer blemishes to be seen. Many of the prints I was unsure of but a couple of impressions looked likely to have been made by flailing wings, I wondered if a grouse had been set upon from above, although there were no loose feather to be seen. It was proving to be all very pleasant in the sunshine although there was still a distinct chill in the air. 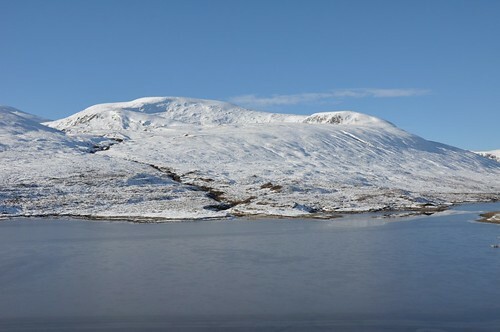 The loch surface looked a little opaque hinting at an icing covering. 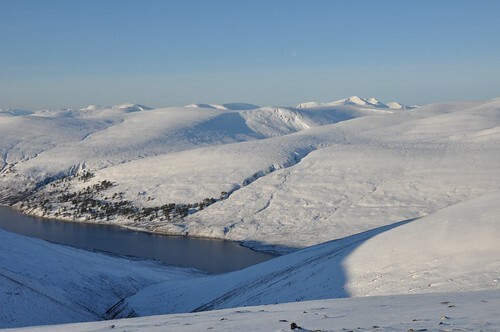 On the opposite shore Caledonian pine added a splash of green to the whitened lower slopes of Am Faochagach while Meall a’ Chuallie stood like a sentry at the head of the loch. 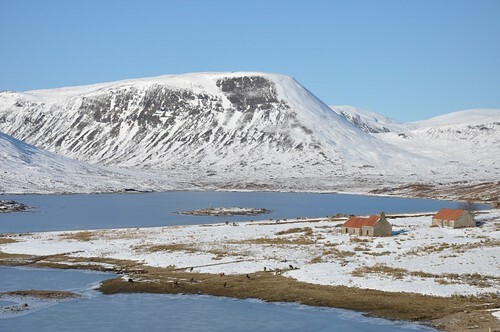 There was a good number of deer grazing around the red roofed deserted houses at Lubachlaggan as I approached. Eventually as they became aware of my presence they soon left the loch shore. I wondered why they had headed directly up hill instead of just away from me. After passing through another gate in the deer fence I realised there was another section of fencing on the opposite side of Allt Lub a‘ Chlagrain leaving only a few meter wide gateway between Lubachlaggan and the open hillside. The deer turned the fence at its top before continuing north down the glen. I topped up my water bottle before following the line of the burn steeply upwards. 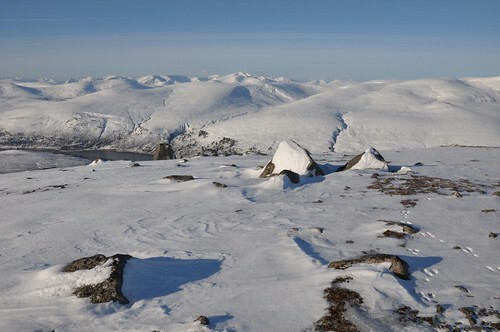 Slowly I worked my way through the soft snow and over the occasionally exposed heathery sections until the going began to ease at a cairn marking the initial line of descent. A couple of walkers appeared soon after and we stopped for a brief chat, they had ascended via Meall a' Ghrianain and confirmed my suspicions that it would be hard work. The snow deepened as the gradient eased and I was glad the couple had left footprints for me to step into, easing my way slightly. 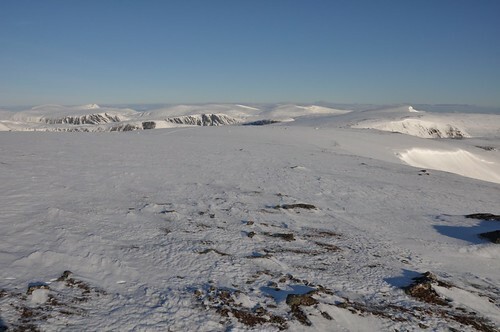 The top of Beinn a’ Chaisteil was now in sight but I could raise no more than a steady plod to cover the final km. Taking my time I surveyed my surrounding taking in some special views whilst keeping an eye out for possible camp spots. The vast blanket of whiteness stretched out seemingly endlessly in all directions. 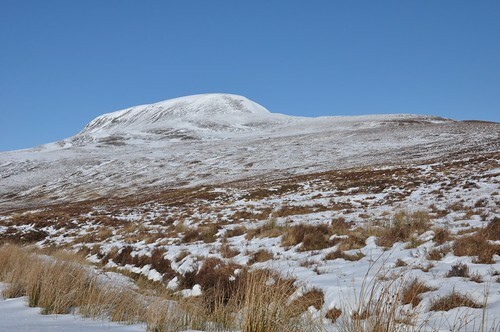 Ben Wyvis looked resplendent in what looked like an iced fondant coat. 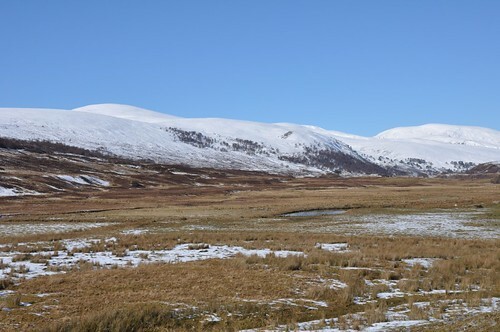 Ben Klibreck showed clear to the far north whilst Seana Bhraigh was the prominent hill to the north west. 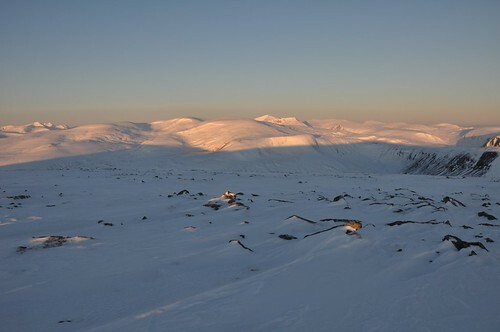 Over to the west was the Ben Dearg range and south west were the Fannichs with Sgurr Mor the standout landmark. 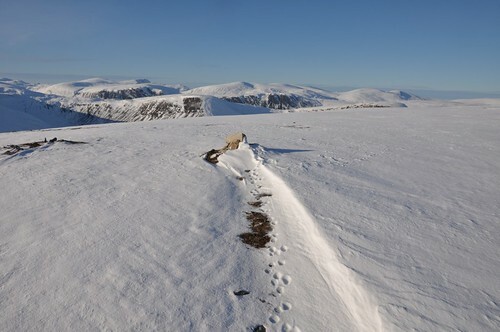 The wind brake cairn had been largely filed with snow but behind there was enough space between a couple of shallow wind blown ridges to squeeze my tent. A bit of stamping down on the soft snow and I soon had a rectangular pitch ready. With the tent up it was time to melt some snow for a brew, the gas seemed to be on a go slow but I was in no rush, I had all night. It was pretty cold and the tent soon started to take on a frosty glaze as the sun started to lower toward the horizon. Fortunately the winds remained as forecast and very light. By the time my meal had re-hydrated it was only just warm despite sitting in the tent inside my spare socks. I finished off meal time with a coffee and some chocolate whilst watching the sunset. 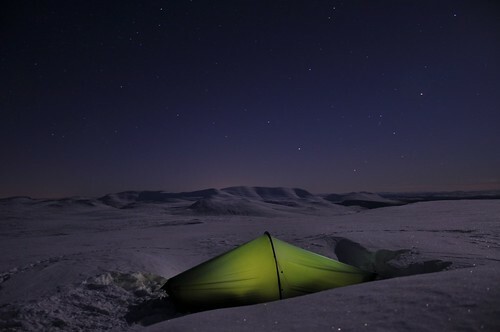 It was sometime later that I got into the tent and lay back peering up at the stars. My sleep was later interrupted by a brightening of the sky but it seemed much too early to be the approach of morning. 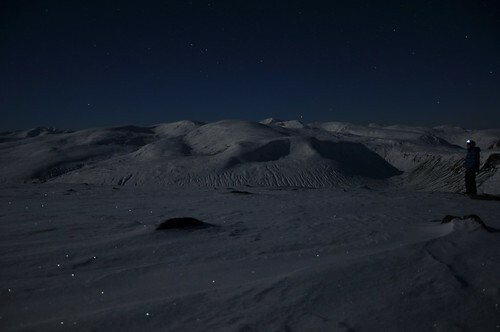 Although only a half moon it was surprising just how much of the landscape was illuminated. I decided to try and get a few night time shots and must have spent over an hour enjoying and trying to capture the scene. 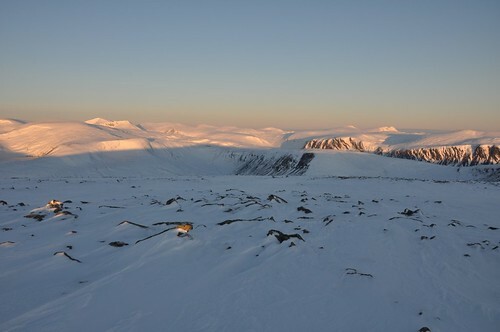 I only managed a couple more hours in my sleeping bag before I was up again, this time to watch the sunrise. 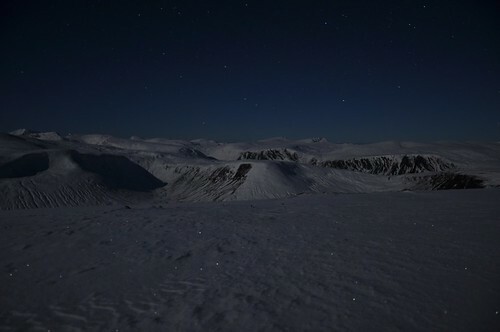 Nothing spectacular, just a gradual brightening, in fact the best colour had been preserved for the pre-dawn lighting. The alpenglow was rather special though, I watched in fascination as the each of the high peaks took a turn to catch a splash of colour from the low rays of the rising morning sun. 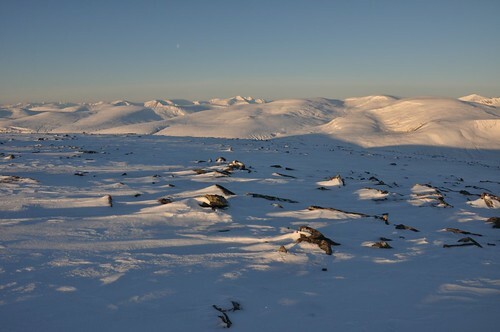 Porridge and coffee warming me through I was soon packed and on my way towards Meall a' Ghrianain. It was back across the snow fields of the last section of my ascent route before turning down to the col that separates the two hills. 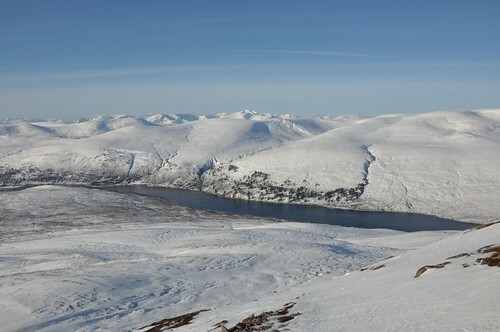 Loch Vaich was now back in view, whilst Sgurr Mor captured the eye in the distance. 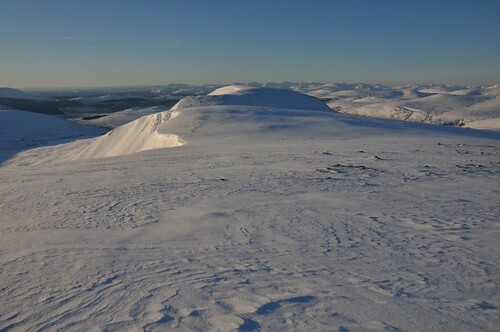 A couple of short iced sections nearly had me stopping to don spikes, but I skirted round and was soon up on the level summit area. I had only been going an hour but wanted to savour the views so decided on a brew stop. 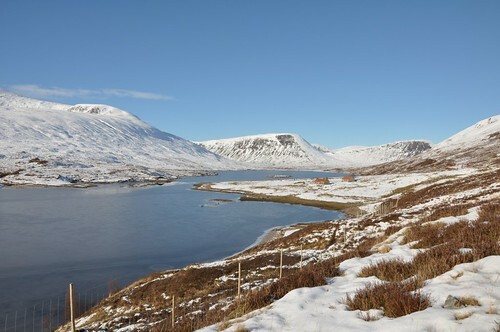 Hot chocolate and a Danish pastry were enjoyed while soaking up my surrounds, I could have stayed all day. Eventually I stirred my self into action. The south ridge of Meall a' Ghrianain drops steeply over the final section and a suggestion of ice under some of the snow had me stop and put on foot irons for a bit of extra security. 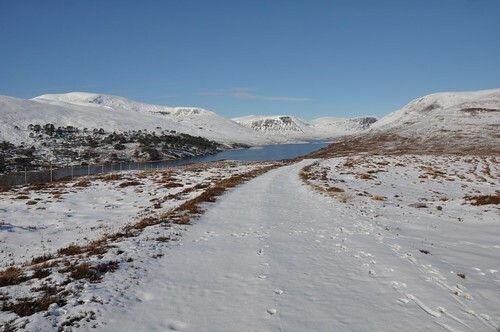 It was a mix of soft snow and heather now as I made my way over toward Meallan Donn, which I skirted on the west side to meet the track I been on the previous day. The normal descent route from here would have been down the path I had come up on, but for a bit of variation I turned toward the dam again before following a track through the trees toward the Weir. A guy on a bike seemed to be taking it rather steadily, the reason soon became apparent as spotted the heard of Highland cows. I’m never too worried about cattle unless there are calves about and as it turned out there were a few. A number adults stood steadfastly on the track but the calves were luckily toward the river. I strolled on slowly putting on an air of indifference without any reaction except one slightly nervous individual who dropped his head a bit too abruptly for my liking. Thankfully the head with its pair of long horns remained low as I passed and I made the gate without incident. I had suddenly warmed up! I removed my fleece for the final push along the last few km of tarmac towards Black bridge. It had been a very fine weekend and a good drive back was only interrupted by a stop at the Tarvie services for a bacon and black pudding roll and cup of tea.